Robert Coleman made best use of Jeagor Farm’s ‘golden’ peg 10 on Sunday. 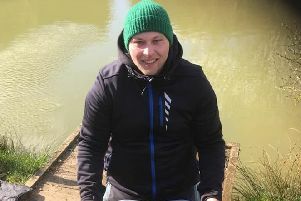 Coleman amassed a mixed bag of silvers and carp to win the match with a weight of 21lb. Second spot went to Bill Brown, on Peg 12, using the long pole. He finished with 19lb 8oz. Eddie Willis came in third on Peg 1 with a weight of 17lb 1oz. Next match is on Saturday, March 14.
n Buzzers along the reeds had been working at the start of last week at Blackdyke Trout Fishery, but on Saturday it was the turn of the damsel nymph. The next round of the Airflo Bankmasters at the Hockwold venue takes place on Sunday, March 22.
n A good morning’s tuition was had by all who attended the Tim Gaunt-Baker’s class at Blackdyke on Saturday. The next one is on Wednesday, March 18 — ring 07525 730447 to book a place.